Vinyl shows some surface wear. Red marker on b-side label. Strong VG play grade. Audio clip included below for the b-side. Tracklisting A Side: Long Walk On A Short Pier B Side: Can You Remember. 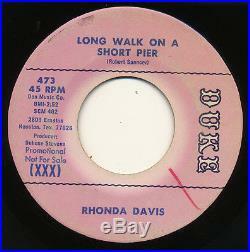 Visit our auctions to see more 45s like thi s. All audio clips & label scans are from the actual record. These have not been enhanced or’cleaned-up’ in any way. Grading System: NM / VG++ / VG+ / VG / VG- / G every effort has been made to accurately describe & grade t his record. All 45s are play graded. We will reply within 24 hours. 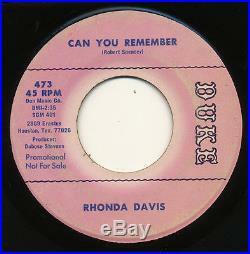 The item “RHONDA DAVIS on Duke CAN YOU REMEMBER northern soul 45 PROMO ORIG LISTEN” is in sale since Monday, August 08, 2016. This item is in the category “Music\Records”. The seller is “diji1978″ and is located in San Diego, California. This item can be shipped worldwide.